The term cerebral palsy (CP) covers a group of non-progressive, but often changing, motor impairment syndromes secondary to lesions or anomalies of the brain arising in the early stages of development. Between 20 to 25 of every 10,000 live-born children in the Western world have the condition (Stanley et al 2000). Problems may occur in utero, perinatal, and postnatal. Infections, traumatic brain injury, near-drowning and strokes in children suffering from neurological problems come under the heading of cerebral palsy. Diagnosis of cerebral palsy resulting from in utero or early perinatal causes may be made immediately after birth, but more commonly occurs between 15 and 24 months. It is possible that CP may be misdiagnosed for years because specific symptoms may show up very late in childhood. 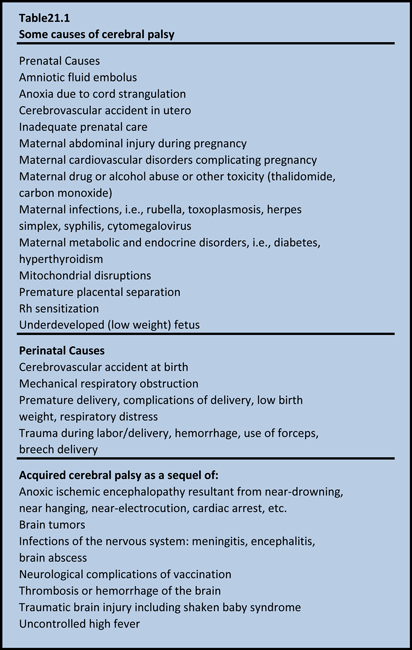 Some of the possible causes of Cerebral Palsy and are listed in Table 21.1. Although several antepartum causes have been described for CP, the role of intrapartum asphyxia in neonatal encephalopathy and seizures in term infants is not clear. There is no evidence that brain damage occurs before birth. A study using brain MRI or post-mortem examination was conducted in 351 full-term infants with neonatal encephalopathy, early seizures, or both to distinguish between lesions acquired antenatally and those that developed in the intrapartum and early postpartum period (Cowan et al 2003). Infants with major congenital malformations or obvious chromosomal disorders were excluded. 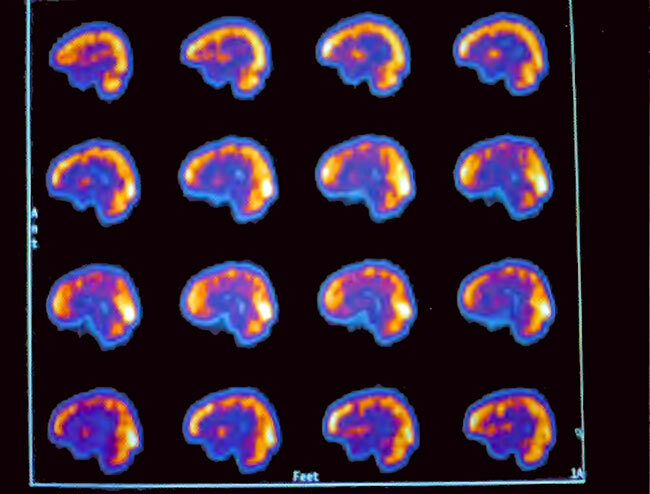 Brain images showed evidence of an acute insult without established injury or atrophy in (80%) of infants with neonatal encephalopathy and evidence of perinatal asphyxia. Although the results cannot exclude the possibility that antenatal or genetic factors might predispose some infants to perinatal brain injury, the data strongly suggest that events in the immediate perinatal period are most important in neonatal brain injury. These findings are important from management point of view as HBOT therapy in the perinatal period may be of value in preventing the evolution of cerebral palsy. Following World War II, oxygen tents and incubators were introduced, and premature infants were given supplementary oxygen to improve their chances of survival, with levels up to 70% being given for extended periods. Epidemics of blindness due to retrolental fibroplasia followed in the 1950s, which led to a restriction of the level of supplemental oxygen to 40%. A reduction in the incidence of blindness followed, which appeared to confirm the involvement of oxygen in the development of the retinopathy. The link between the use of recurrent supplemental oxygen and the rise of retinopathy was rapidly accepted, even though it was suggested that retrolental fibroplasia was produced by initially preconditioning a child to an enriched oxygen environment and then suddenly withdrawing the same: The disease occurred only after the child’s removal from the high oxygen environment (Szewczyk 19 51). It was also noted that retinopathy developed upon the withdrawal from the high level of oxygen, and that probably the best thing to do was to return the child to the oxygen environment (Forrester 1964). Under these circumstances, in many of the patients, the results were encouraging, and vision returned to normal. A slow reduction of oxygen and final return to the atmospheric concentration for several weeks was all that was needed to restore the vision. Thus, there is no rational basis for withholding oxygen therapy in the neonatal period. As mentioned in other chapters of this textbook, retrolental fibroplasia is not associated with HBOT. It is unfortunate that nearly all affected newborns today are deprived of appropriate oxygen therapy because of the fear that it will cause retrolental fibroplasia (see Chapter 31). Some observations indicate that since the practice of administration of high levels of oxygen has been abandoned, there is a rise in the incidence of cerebral palsy as compared to previous levels. The use of hyperbaric oxygenation in the pediatric patient was relatively common in Russia (see Chapter 28) . HBOT has been used in Russia for resuscitation in respiratory failure, for cranial birth injuries, and for hemolytic disease of the newborn. HBOT was reported to reduce high serum bilirubin levels and prevent development of neurological disorders. In cases of respiratory distress, delayed use of HBOT (12-48 h after birth) was considered useless. However, early use (1-3 h after birth) led to recovery in 75% of cases. The Italian physicians began treating the small fetus in utero in 1988 demonstrating a reduction of cerebral damage. Patients were hospitalized before the 35th week and hyperbaric treatments were given every 2 weeks for 40 min at 1.5. The fetal biophysical profile showed a remarkable improvement as soon as the second treatment. At the conference “New Horizons for Hyperbaric Oxygenation” in Orlando, Florida, in 1989, results were presented of HBOT therapy of 230 Cerebral Palsy patients who had been treated in the early stages since 1985 in Sao Palo, Brazil (Machado 1989). Treatment consisted of 20 sessions of 1 h each at 1.5 ATA (100% oxygen), once or twice daily in a Vickers monoplace chamber. A few of the children had exacerbation of seizures or developed seizures. The results showed significant reduction of spasticity: 50% reduction in spasticity was reported in 94.78% of the patients. Twelve patients (5.21%) remained unchanged. However, follow-up included only 82 patients, and 62 of these (75.6%) had lasting improvement in spasticity and improved motor control. The parents reported positive changes in balance and “intelligence with reduced frequency of seizure activity.” Results of a continuation of this work in Brazil were presented by in 2001 at the 2nd International Symposium on Hyperbaric Oxygenation and the Brain Injured Child held in Boca Raton, Florida, to include 2,030 patients suffering from childhood chronic encephalopathy that had been treated since 1976, 232 of whom were evaluated with long-term follow-up; age ranged from 1 to 34 years. The improvements were noted as follows: 41.81% decreased spasticity, 18% noted global motor coordination improvement. Improvements were also noted in attention: 40.08%, memory, 10.77%, comprehension, 13 .33%, reasoning, 5.60%, visual perception, 12.93%, sphincter control, 6.46%. It was concluded from this study that HBOT therapy should be instituted as early as possible in such cases. Another presentation at the 2nd International Symposium was a study by Chavdarov, Director of the Specialized Hospital for Residential Treatment for Rehabilitation of Children with Cerebral Palsy in Sofia, Bulgaria, where HBOT had been considered an important part of the management of children with CP since 1997. This study included 50 children with distribution of various types as follows: spastic Cerebral Palsy (n = 30), ataxic/hypotonic cerebral palsy (n = 8), and mixed cerebral palsy (n = 12). Measurements included motor ability, mental ability, functional development, and speech. Overall psycho-motor function (single or combined) improved in 86% of the patients following 20 HBOT sessions at 1.5-1.7 ATA lasting 40-50 min once daily. The first North American case of Cerebral Palsy treated with HBOT was in 1992. The case was presented by Paul Harch at the Undersea and Hyperbaric Medical Society meeting in 1994 (Harch 1994). In 1995, Richard Neubauer began treating Cerebral Palsy using HBOT. Because of the growing worldwide anecdotal reports, a small pilot study of HBOT therapy in cerebral palsy children was conducted in the UK in 1995, which showed similar improvements in a group of seriously brain-injured children and led to the foundation of the Hyperbaric Oxygen Trust, a charity to treat Cerebral Palsy and the brain injured children. The Trust, which has since changed its name to Advance, has treated over 350 patients, though no scientific appraisals have been published. Positive anecdotal reports of its use in cerebral palsy started to accumulate. As more HBOT treatment clinics for Cerebral Palsy opened in the United States and Canada, further studies were conducted. It is estimated that over 5000 children with Cerebral Palsy have been treated worldwide with HBOT. In 1999 the first pilot study in the use of HBOT in Cerebral Palsy was published (Montgomery et al 1999). This study involved 23 children (10 female, 15 male; age range 3.1 to 8.2 years) with spastic diplegia. Absence of previous surgical or medical therapy for spasticity was one of the prerequisites for inclusion as well as a 12-month clinical physiotherapy plateau. The study was performed at McGill University Hospital’s Cleghorn Hyperbaric Laboratory in a monoplace chamber at 1.75 ATA (95% oxygen) for 60 min daily and at the Rimouski Regional Hospital in a multiplace chamber ( 60 min at 1.75 ATA twice daily) for 20 treatments in total. Assessments, pre- and post-treatment, included gross motor function measurement (GMFM), fine motor function assessment (Jebsen’s Hand Test), spasticity assessment (Modified Ashworth Spasticity Scale) as well as parent questionnaire and video analysis. Results following treatment were an average of 5.3% improvement in GMFM and a notable absence of complications or clinical deterioration in any of the children. “Cognitive changes” were observed, but these were nonspecific. Video analysis was also positive. The obvious flaws of this study were the lack of placebo control and the application of two different HBOT protocols. The assessment tools utilized also had inherent variations. Montgomery achieved improvement in Cerebral Palsy children using 20 treatments at 1.66 ATA oxygen (1.75 ATA 95% O2)/60 min), but the children experienced rapid regression of neurological gains after cessation of treatment. The number of treatments was inadequate as the authors of this chapter had recommended 40 treatments at 1.5 ATA/60 min, because consolidation of the gains does not occur until 30 to 35 treatments. This first study, however, provided useful data regarding the potential efficacy of HBOT therapy and provided the justification for a larger controlled, randomized study. The results of just such a prospective, hyperbaric-air controlled, randomized multicenter study have been published “with intriguing results” (Collet et al 2001). This study included 111 Cerebral Palsy children (ages 3-12 years) that were randomized into two groups: receiving either 1.75 ATA 100% oxygen or 1.3 ATA room air (the equivalent of 28% oxygen at 1 ATA) for 1 h for a total of 40 treatments. Gross and fine-motor function, memory, speech, language, and memory were assessed. Improvement in global motor function was 3% in the hyperbaric air group and 2.9% in the hyperbaric-oxygen-treated group. Although the results were statistically similar in both groups, the HBOT-treated group had a more rapid response rate in the more severely disabled children. Cognitive testing was performed on a subset of the preceding study to investigate the effect of HBOT on cognitive status of children with CP (Hardy et al 2002). Of the 111 children diagnosed with CP (aged 4 to 12 years), only 75 were suitable for neuropsychological testing, assessing attention, working memory, processing speed, and psychosocial functioning. The children received 40 sessions of HBOT or sham treatment over a 2-month period. Children in the active-treatment group were exposed for 1 h to 100% oxygen at 1.75 atmospheres absolute (ATA), whereas the sham group received only air at 1.3 ATA. Children in both groups showed better self-control and significant improvements in auditory attention and visual working memory compared with the baseline. However, no statistical difference was found between the two treatments. Furthermore, the sham group improved significantly on eight dimensions of the Conners’ Parent Rating Scale, whereas the active treatment group improved only on one dimension. Most of these positive changes persisted for 3 months. No improvements were observed in either group for verbal span, visual attention, or processing speed. Unfortunately, the Collet study increased the pressure to 1.75 ATA of 100% oxygen for 60 min (40 treatments) and to 1.3 ATA in the control group breathing air for 60 min, i.e., a 30% increase in oxygen for the controls. This dose of HBOT had not been used previously in Cerebral Palsy patients and was possibly an overdose (Harch 2001) and likely inhibited the HBOT group’s gains. Evidence for this was seen in the GMFM data where five of the six scores increased in the HBOT group from immediate post HBOT testing to the 3-month retest versus three of six scores in the controls. Some of the negative effects of 1.75 ATA likely had worn off by this time. Results of the Collet study showed significant improvements in both groups, but no difference between groups. The serendipitous flaw in the study was the 1.3 ATA air control group, which also improved significantly. This underscored the fact that the ideal dose of HBOT is unknown in chronic pediatric brain injury, but it suggested that oxygen signaling may occur at very low pressures. Mild HBOT therapy can be effective in improving SPECT as well as attention and reaction times (Heuser & Uszler 2001). Therefore, the beneficial effect in patients described by Collet and colleagues is probably related to the beneficial effects of slightly pressurized air rather than to the act of participating in the study. In addition a biphasic sham pressurization, which is highly recommended for a control group, was not used in this study. The duration of this study was only 2 months. Perhaps this length of time is not sufficient for evaluating neuropsychological effects of HBOT in a chronic neurological condition. The controversy regarding this study will undoubtedly take a long time to resolve, but it has already begun to raise some very important issues and some very important questions about the validity of “mild” HBOT (1.3-1.35 ATA air or the same pressure supplemented with oxygen concentrator). The first issue is that 1.3 ATA ambient air was not an inert or true placebo, but had a real effect on the partial pressure of blood gases and perhaps other physiological effects as well. Compressed air at 1.3 ATA increases the plasma oxygen tension from 12.7 kPa (95 mmHg) to 19.7 kPa (148 mmHg), and the increase of a concentration of a reactive substrate by 50% is substantially notable. Rather than answer the question of effectiveness of HBOT in CP the Collet study and its offspring Hardy (2002) substudy confused the scientific community not familiar with hyperbaric oxygen. The unequivocal finding of these studies is that both pressure protocols achieved statistically significant objective neurocognitive gains, a phenomenon that cannot be attributed to placebo. 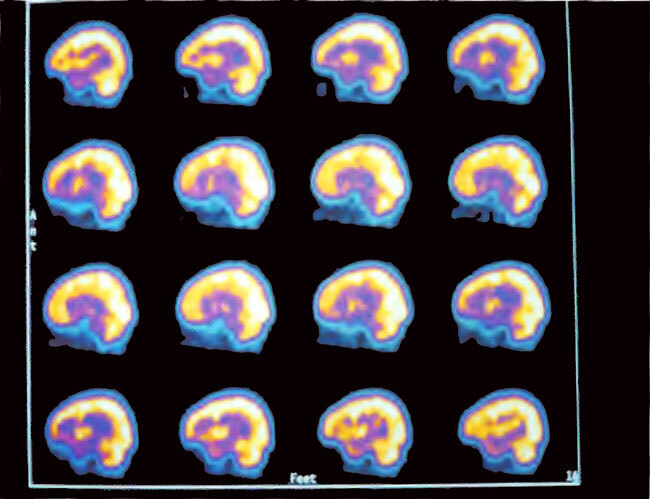 This reinforced the findings of the other non-controlled studies in the chronic category above, and was strengthened by the studies using functional brain imaging as surrogate markers (Harch 1994a, Neubauer 2001, and Golden et al 2002). Upon the urging of interested parents, Dr. Maureen Packard of Cornell University in New York City agreed to perform such a study. This study was randomized to immediate and delayed (6 months later) treatment with HBOT (the delayed treatment group to serve as an untreated control group). Age range was 15 months to 5 years with moderate to severe Cerebral Palsy and patients were given 40 1-h sessions at 1.5 ATA, once a day, 5 days a week for 4 weeks. The study population included 26 children with cerebral palsy secondary to prenatal insults, premature birth, birth asphyxia, and post-natal hemorrhage. The average age of enrollment was 30 months. Nine patients presented with cortical visual impairment. Assessment was neurodevelopmental, Bayley II (cognitive), Preschool Language Scale, Peabody Motor Scale, Pediatric Evaluation of Disabilities Inventory(PEDI), parental report of specific skills including mobility, self-care and social interaction. Final assessments were available on 20 subjects. The only side effects of the study were barotrauma in nine children requiring placement of a ventilation tube or myringotomy. Assessments were performed at four time points: enrollment (Tl), after the immediate group had received treatment (T2), prior to the delayed groups’ HBOT therapy 5 months after enrollment (T3), and after the delayed groups’ treatment (T4). There was a significant difference (p < 0.05) in the improvement of scores on the mobility sub-domains for the time period T2 minus Tl in favor of the immediately treated group. For the period T4 minus T3 there was a trend favoring the recently treated delayed group and a trend in the social function subdomain in the more recent treated group. Parental diaries over the month of treatments demonstrated 83% marked improvement in mobility, 43% marked increase in attention, and 39% marked increase in language skills. Overall, there was some improvement in mobility in 91%, in attention in 78%, in language in 87%, and in play in 52%. One family saw no improvement and six families minimal improvement for a total of 30%. Five families (22%) reported major gains in skills, and 11 families reported modest gains (48%). Four of the nine children with cortical visual impairment had improvement in vision noted by families, vision therapists, and ophthalmologists. There was no statistical difference in Peabody or Bayley II scores on blinded assessment. Their conclusions at 6-month post-interview were that although changes in spasticity may diminish over time, improvements in attention, language and play were sustained. ‘”This increase in attention is particularly important for children must be aware’ in order to learn. This represents a direct impact on cognitive functioning. The main differences between HBOT and traditional therapies are the rapid gains over time and the impact on cognitive skills, which, in general are not improved by physical, occupational and speech therapies.” This study was presented At the University of Graz, on 18 November 2000. Shortly after the previous studies were begun, the US Army conducted a small study on functional outcomes in children with anoxic brain injury. Baseline and serial evaluations showed improvement in gross motor function and total time necessary for custodial care in nine children with Cerebral Palsy. Eight volunteer (parental) subjects with varying degrees of Cerebral Palsy and one near-drowning victim were included in this investigation. Of the Cerebral Palsy cases studied, the mean age was 6.4 years (range 1.0- 16.5 years), and the near drowning patient was 5.6 years of age seen 1 year post incident. Pretreatment evaluation included gross motor function ( GMPM, lying, rolling, crawling and kneeling, sitting, standing and walking, running, and jumping), the Modified Ashworth Scale (MAS) for spasticity, rigidity, flexion/extension, the Functional Independence Measure for Children (WeeFIM) regarding self-care, sphincter control, transfers, locomotion, communication and social cognition, video, 24-h time measure, parental questionnaire, and single photon emission computerized tomography (SPECT) scanning. Testing was conducted every 20 treatments with the exception of SPECT and parental questionnaire which were completed at 40 and 80 sessions. All subjects received 80 HBOT treatments in a multiplace chamber (100% oxygen) at 1.75 ATA (60 min for each session) daily (Monday to Friday) for 4 months. Each patient served as his or her own control as compared to the baseline scores. Improvements in GMFM in the categories of lying and rolling, crawling and walking, sitting and walking, running and jumping were statistically significant (p < 0.05) . The total time necessary for parental care also showed a statistically significant improvement (p < 0.03%) in reduction of custodial time required. In the parental questionnaire, overall improvement was indicated through the end of the study, including other assessments not included in the survey. Three children demonstrated improved swallowing function and were able to ingest a variety of liquids and foods; there was reduction in strabismus in two subjects, nystagmus was resolved in one participant, and one patient experienced complete resolution of a grade 3 vesicoureteral reflux, obviating the need for surgery. Unfortunately, the SPECT scan results were omitted due to multiple technical and procedural problems. Overall improvement was 26.7% at 30 treatments, up to 58.1% at 80 treatments. Their conclusions were that HBOT therapy seemed to effect overall improvement in Cerebral Palsy (with little response in the near-drowning case), although the optimum number of treatments remained undetermined, since the improvements were noted at the end of the study. They advised further research and follow-up studies to determine the true potential of HBOT for children with anoxic injury and Cerebral Palsy. Studies of the use of mild HBOT, hyperbaric air, supplemental oxygen, and higher pressures of HBOT must be continued to eventually determine the ultimate benefits for cerebral palsy and to identify the subgroups of patients who may benefit from each. Investigations of mild HBOT therapy are currently ongoing in Russia, the United States, and South America. Up to April 2003, the Ocean Hyperbaric Neurologic Center (Fort Lauderdale, Florida) has treated over 600 children suffering from Cerebral Palsy and brain injury. Analysis of these cases has not yet been completed. Another 200 children with Cerebral Palsy and a large variety of neurological disorders have been treated at the Harch Hyperbaric Center in New Orleans (Louisiana, USA). One case is shown here as an example. The patient is a 2-year-old boy whose twin died in utero at 14 weeks. He was delivered at term by vacuum extraction and developmental delay was detected at the age of 4- 5 months. He was diagnosed as a case of cerebral palsy. 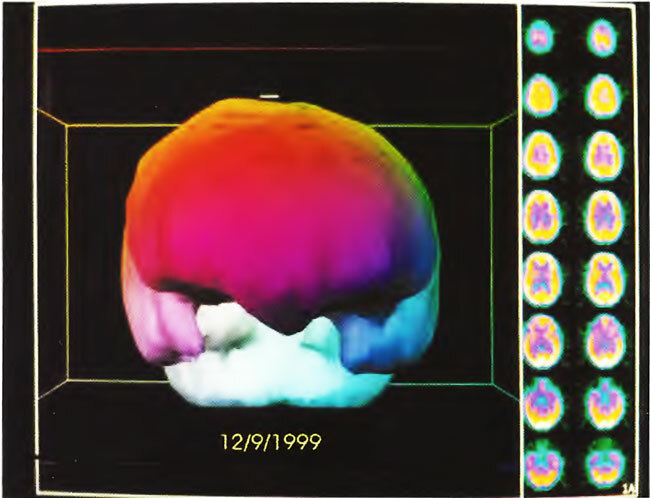 At 2 years of age SPECT brain imaging was performed and showed a heterogeneous pattern of cerebral blood flow. The patient underwent a course of twice daily, 5 days/week HBOT treatments in blocks of 50 and 30 treatments. At the conclusion of treatments he showed improvement in spasticity, speech, chewing/swallowing, cognition, and ability to sit in his car seat and stroller for prolonged periods. Repeat SPECT brain imaging showed a global improvement in flow and smoothing to a more normal pattern consistent with the patient’s overall clinical improvement. 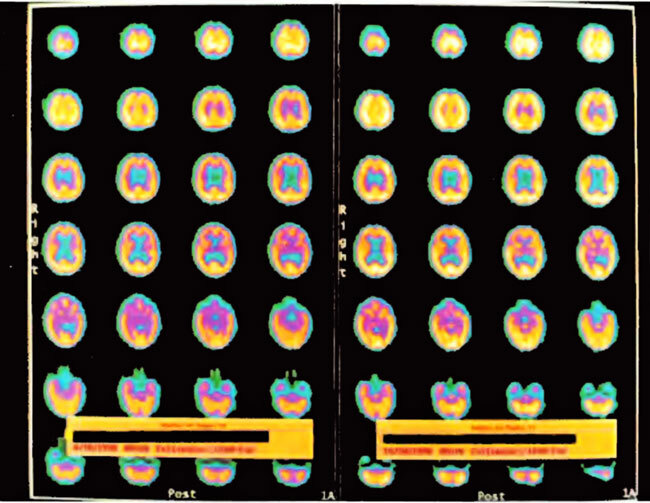 The two SPECT scans are shown side by side in Figure 21.1. Three dimensional reconstructions of the two scans are shown in Figures 21.2 and 3. The patient is an 8-year-old boy with a history of cerebral palsy. He had spastic diplegia secondary to premature birth from a mother with eclampsia. Patient was delivered by emergency Cesarean section at 27 weeks when his mother developed seizures. APGARS scores were 7 and 8. The patient spent 5 months in the hospital primarily because of feeding problems. The patient did not achieve normal milestones and developed infantile spasms at 2 years of age. 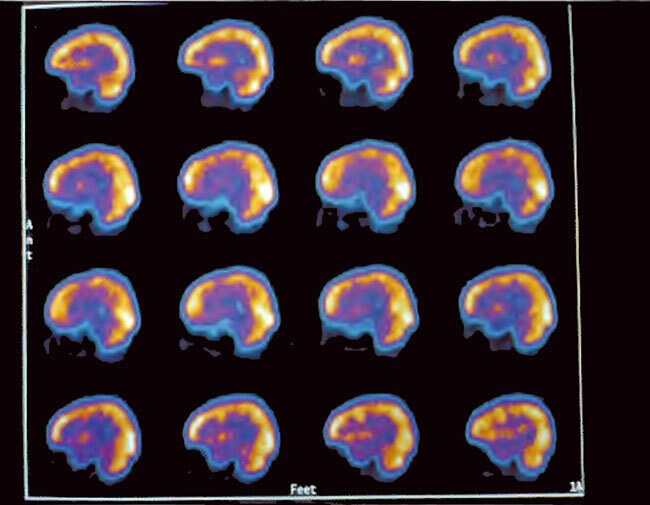 Baseline SPECT brain imaging (Figure 21.4) showed a mildly/moderately heterogeneous pattern and reduction of blood flow. Three hours after a single HBOT session at 1.5 ATA for 60 min, repeat SPECT showed global improvement and smoothing to a more normal pattern in Figure 21.5. The patient underwent a course of 80 HBOT sessions (1.5 ATA/60 min) over the next 6 months in two blocks of treatment (twice daily, 5 days/week x 40, then once-daily 5 days/week x 40), and showed improvement in his impulsive inappropriate behavior, motor function, vision, and constipation. Repeat SPECT brain imaging reflected these neurological gains (Figure 21.6), showing generalized improvement in cerebral blood flow and pattern. Three-dimensional surface reconstruction of Figures 21.4, 21.5, and 21.6 are presented in Figures 21.7, 21.8, and 21.9, respectively. While there is a global increase in blood flow, the most significant relative increase in flow is to the temporal lobes as shown in the three-dimensional figures. All SPECT brain imaging was performed on a Picker Prism 3000 at West Jefferson Medical Center. All scans were identically processed and three dimensional thresholds obtained by Phillip Tranchina. Pictures of the scans in the above figures were produced by 35 mm single frame photography under identical lighting and exposure conditions. Figure21.1. SPECT brain imaging transverse images of baseline pre-HBOT study on the left and after 80 HBOT treatments on the right. Note the global increase in flow and change from heterogeneous to the more normal homogeneous pattern. Slices begin at the top of the head in the upper left corner and proceed to the base of the brain in the lower right corner of each study. Orientation is standard CT: the patient’s left is on the viewer’s right and vice versa with the patient’s face at the top and the back of the head at the bottom of each image. Color scheme is white, yellow, orange, purple, blue, black from highest to lowest brain blood flow. Figure 21.2. 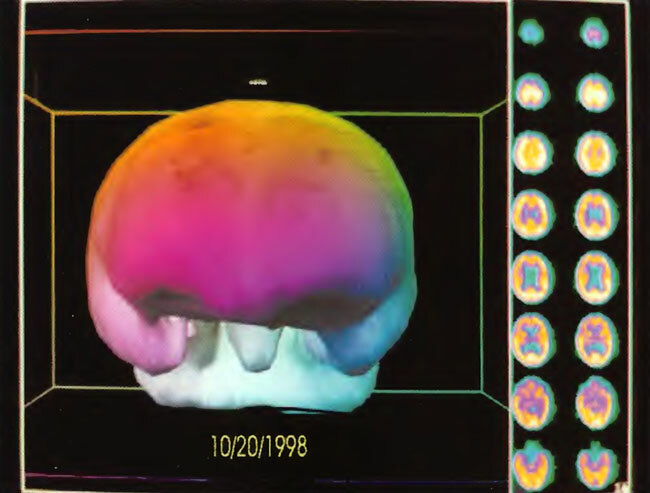 Three-dimensional reconstruction of baseline SPECT study in Figure 21.1 (study on left side). 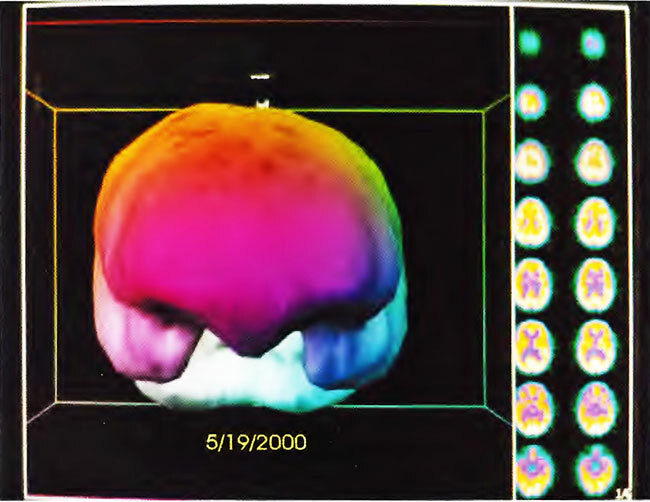 Note reduction in flow to both temporal lobes, inferior frontal lobes, and the brainstem (central round structure between the temporal lobes below the large colored area-frontal lobes). Figure 21.3. 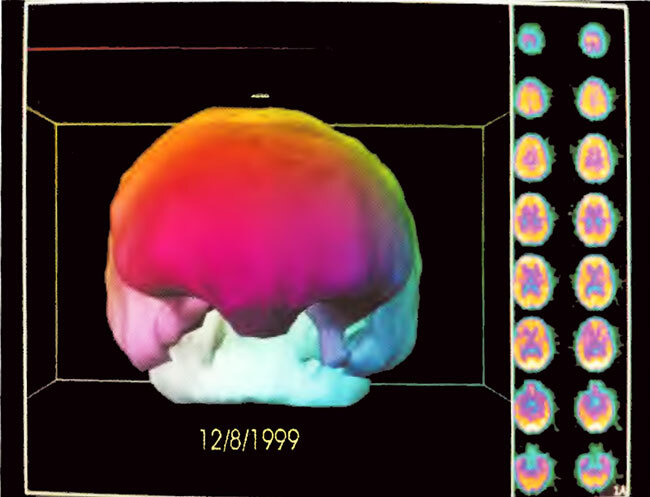 Three-dimensional reconstruction of SPECT after 80 HBOT treatments (right hand study in Figure 21.1) Note the increased flow to the temporal lobes, inferior frontal lobes, and brainstem. Figure21.4. 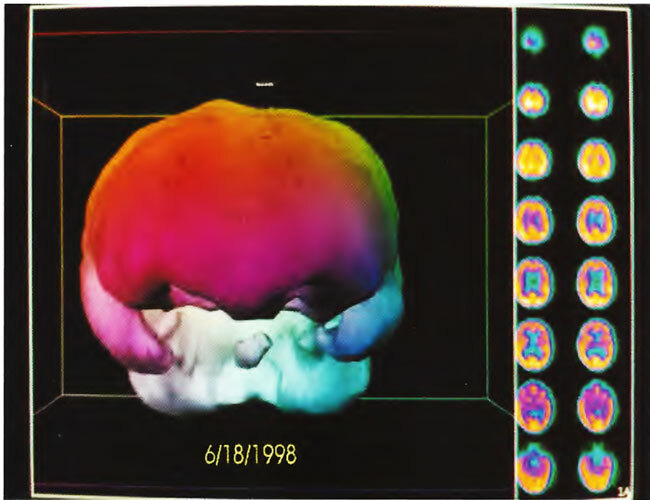 Sagittal slices of baseline SPECT brain imaging through the center of the brain. Note the heterogeneous pattern of blood flow. Slices proceed from the right side of the head in the upper left corner to the left side of the head in the lower right corner. The front of the brain (face) is on the left side and the back of the brain (back of the head) is on the right side of each slice. Figure21.5. Sagittal slices of SPECT three hours after a single 1.5 ATA/60 min HBOT treatment. Note the generalized increase in flow and smoothing to a more normal pattern. Figure 21.6. Sagittal slices of SPECT after 80 HBOT treatments. Note the marked increase in flow and smoothing of the pattern compared to the baseline in Figure 21.4. Figure21.7. Three-dimensional surface reconstruction of SPECT in Figure 21.4. Note reduction in flow to the temporal lobes and coarse appearance of flow to the surface of the brain. Figure 21.8. Three-dimensional surface reconstruction of SPECT in Figure 21.5. Note improvement in flow to the temporal lobes and slight smoothing of flow to the surface of the brain. Figure21.9. Three-dimensional surface reconstruction of SPECT in Figure 21.6. Note improvement in flow to the temporal lobes and slight smoothing of flow to the surface of the brain. Cerebral palsy is the result of a large variety of causes, and it is difficult to design trials with subgroups of patients with similar pathomechanisms. The results of several studies have been presented including one controlled study that did not show improvement in neuropsychological status. A large number of patients have been treated, and some have been followed up for long periods to document improvement that can be correlated with imaging studies. Cognitive improvement is usually seen by the 40th treatment in patients with chronic neurological disorders such as Cerebral Palsy (Golden et al 2002). Controlled studies of HBOT in CP should continue, but they may not resolve all the issues. The extensive experience of open clinical studies with some good results cannot be ignored. In a condition where there is nothing else to offer, HBOT therapy is considered to be worth a trial. The concept of personalized medicine as described in Chapter 38 can be applied to HBOT treatments in Cerebral Palsy. One cannot recommend a standard protocol, but the ideal treatment schedule should be determined for each patient including the pressure, dose, and duration of treatment. It may be possible to identify responders early on in the treatment. Although molecular diagnostic procedures may be used in the investigation of patients with Cerebral Palsy, genotyping and gene expression studies have not yet been done as a guide to treatment but this is a promising field for future investigation (Jain 2003i).